When creating an easy to follow monthly budget you will need to go through a careful planning and goal setting phase. When these two are achieved, the next steps towards saving money will be that much easier for you to do. It will be hard to resist not buying all of your wants especially after receiving your salary. I know I always had in mind something I wanted to buy when I got paid next, we have to change that way of thinking. Separate your needs and wants to ensure you are aware of what it is you really don’t need to be spending money on, such as coffee out 3 times a day or that 20th pair of boots. Have lists for whenever you shop at stores and always use them as your guide. Your list will be your partner in reminding yourself about what not to spend money on and to buy only what is necessary and planned. Your monthly income might be less then what you are actually spending. Do you end up using credit cards or taking out cash advances when approaching the months end? Are you not saving any money for emergencies? Calculate what you actually spend each month and be sure that you are not going over and that you are actually rolling some money over into savings. Be sure to factor in every little purchase, it all adds up. Make the cut backs you need to, to balance your budget. If you need to live cable free or walk places instead of using gas etc. then do it. You can even try giving yourself a daily budget, especially on outings with friends etc., only keep the amount you can afford to spend in your wallet for that day. Don’t forget to factor in all if your utilities, insurance, gas, mortgage or rent, groceries, school trips and whatever other expenses may be in your lifestyle. Always keep checking that you are staying on budget, it may be easiest at first to begin with a weekly budget as mentioned earlier. If you already have kids or are living as a family then creating a budget may change slightly. You will need to hold a family meeting and go over with everyone their needs vs wants, and what they want to make their priorities. Hockey fees, dance class, even a trip to the dentist may be needed, everything that may come up you will need to prepare and budget for. Maybe the kids can cut out their lunch allowance and start making their own lunches at home to save money. Having your budget also means that you will begin to focus on your priorities. You can become more frugal or simply have limits on the things you want to have and would normal spend on. Making rent monthly or car payments, saving for emergencies is obviously more of a priority then clothes shopping or buying a few drinks out. Be sure to think of the future, is Christmas coming up? Do you need to start a retirement fund? Do the kids have emergency savings? I remember when my son had a tooth infection and a trip to the dentist ended up being a $3,000. Luckily I had a separate fund just for that! Be clear of your priorities and stay focused on them, this will become easier as you start reap the rewards of creating your budget and sticking to it. 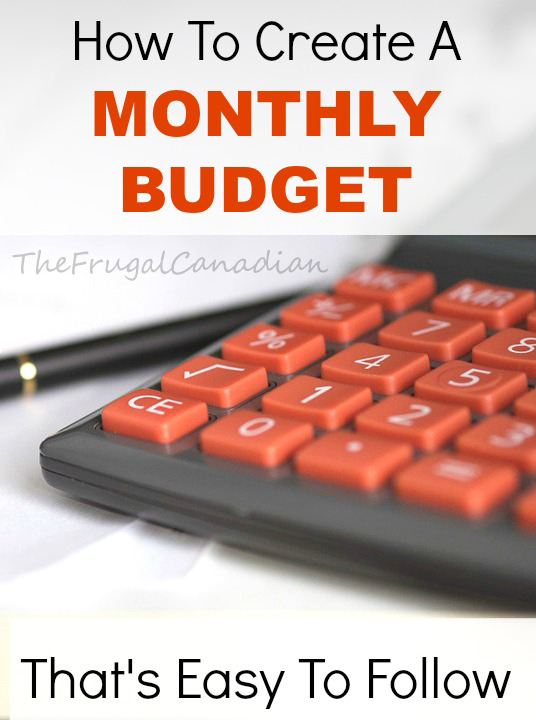 Hopefully we have giving you enough tips on How To Create A Monthly Budget That Is Easy To Follow so you can now make your own budget.